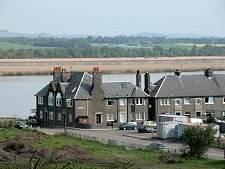 Newburgh is built on the south bank of the River Tay opposite Mugdrum Island where the navigable channel of South Deep runs right along the riverbank. 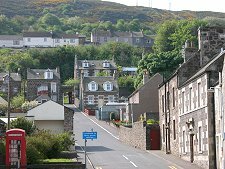 Its site is a sloping one, for the land behind climbs steeply to form the eastern end of the Ochil Hills. Two forces came together to shape Newburgh: the church and the river. There was probably a fishing settlement already established here by 1191. 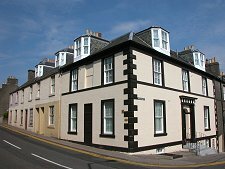 That was the year in which David, 1st Earl of Huntingdon and younger brother of both Malcolm IV and William I, founded Lindores Abbey on a site at the east end of today's Newburgh. 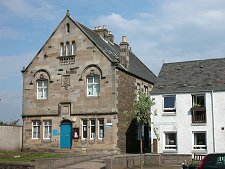 The Tironensian abbey was first established as a daughter house of Kelso Abbey and most of it was built during the lifetime of the first abbot, Guido, who died in 1219. 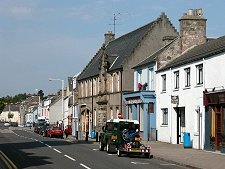 Newburgh's "coming of age" was in 1266 when Alexander III gave the monks at Lindores Abbey permission to establish the town as a burgh with a weekly market. The abbey thrived, being spared the regular bouts of destruction which befell so many Scottish abbeys further south. In 1298 it paid host to William Wallace after his victory at the nearby Battle of Blackearnside. 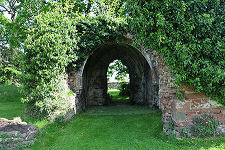 Lindores Abbey's end came in 1559 when a rabble roused by John Knox's distinctive brand of religious intolerance "overthrew the altars, broke up statues, burned the books and vestments and made them cast aside their monkish habits". The ruins that were left became known locally as the wasteland, their deterioration helped by their use as a quarry as Newburgh expanded. By the mid 1800s Newburgh harbour, then comprising a quay running along the riverside and four jetties at right angles to it, was home to 40 boats, mostly engaged in salmon or sprat fishing. 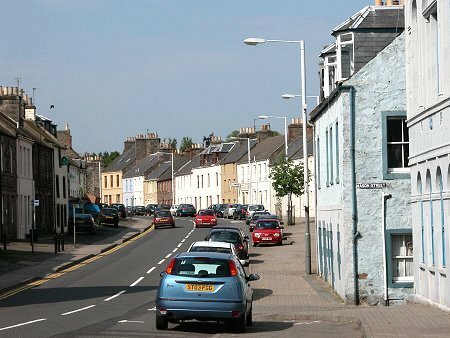 Secondary businesses thrived, including no fewer than 35 pubs or inns. The railway arrived in Newburgh in 1848, but the surrounding topography meant the station had to be at quite high level on the slopes south of the High Street. The absence of a rail link to the harbour contributed to the latter's decline over the century that followed and by the late 1980s the quay was virtually unused. Today the riverside area of Newburgh is steadily being occupied by new housing. 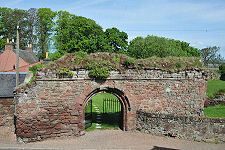 Meanwhile, work to preserve the remains of Lindores Abbey has been undertaken by the owner of the site and resident of Lindores Abbey House. 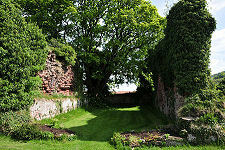 The abbey is open to the public, thanks to what some regard as Lindores Abbey's most enduring legacy to Scotland and to the world. 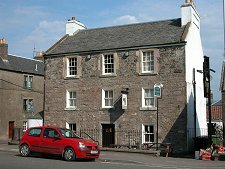 In 1494 James IV was staying at nearby Falkland Palace and the exchequer roll for that year records the granting "To Friar John Cor, by order of the King, to make aquavitae, VIII bolls of malt". 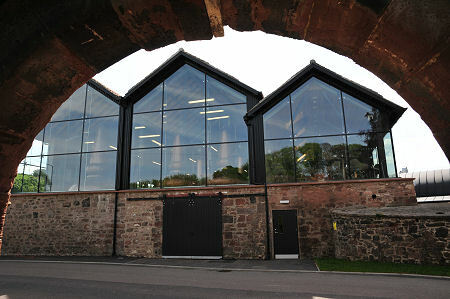 This is the first written record of whisky production anywhere in Scotland. 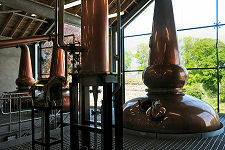 Eight bolls is the equivalent of nearly 500kg and suggests that a large scale distillery was already well established at Lindores Abbey. 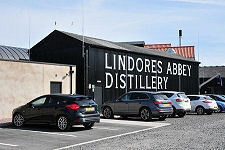 It is very appropriate that a new magnificent distillery, the Lindores Abbey Distillery, has been built in what can justifiably claim to be the The Spiritual Home of Scotch Whisky.